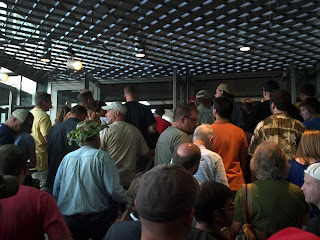 Since the Saturday afternoon session is for Brewing Association and American Home-Brew Association members only, their was no "members only" line to get in quickly. It really helps put into perspective how great having access to the quick line was for the other sessions. We got there about 11:50 or so and had to walk almost all the way around the huge Denver Convention Center to get in line. Luckily, once the line gets moving, it is quick. Still, it is much nicer to do the short line. Unfortunately, I had forgotten my list in the mini-van, so I had to recreate my plan. 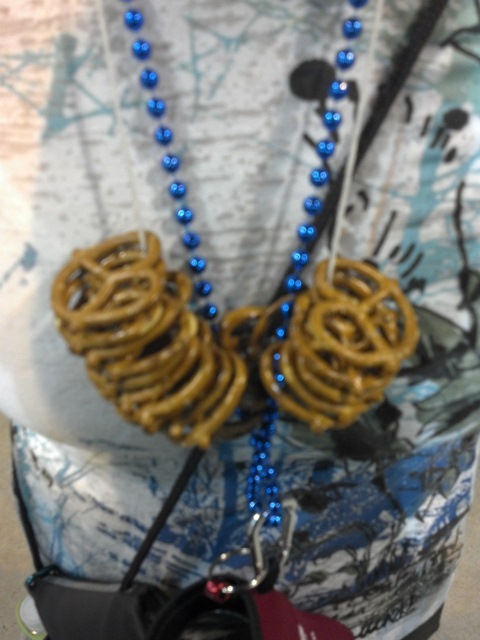 Luckily I had some time to do that while standing in line. 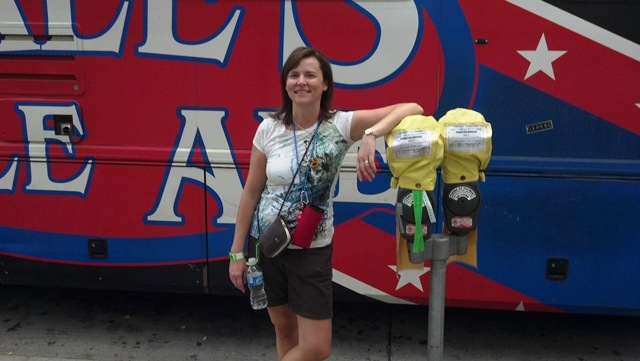 The first stop on Saturday was A2, the very first booth of the festival, 21st-Amendment Brewery. I had myself a Brew Free or Die IPA and a Back in Black. Both were hoppy and wonderful. Next, we stopped by Bear Republic to sample Racer 5 IPA, Racer X, and Black Racer. Also all hoppy and wonderful. We found ourselves at A34 Uncommon Brewers where I let the volunteer talk me into trying a Bacon Brown Ale. Generally speaking, I am not a fan of Bacon beers, but this one was actually very good. The bacon was subtle enough that it did not over-power the taste. It also had nice head retention. I sort of wish the brewer had been there so I could have asked him how he went about brewing this beer. While in the Pacific Northwest, we hit quite a few booths: 10 Barrel Brewing Company, Barhop Brewing, Boneyard Beer Co, Breakside Brewery, BridgePort Brewing Company (BridgePort Stumptown Tart was tasty). All the beers we had along here were very good. Next, we headed over to Seabright Brewery F33. You may recall that yesterday I had meant to write this booth down for their Golden Sour. I was not disappointed today. It was indeed another tasty sour beer. Since we were right there, we also tried some Shmaltz Brewing Company beers. Shmaltz is of course the company that brews kosher He'Brew beers. Not only are they certified kosher, but they are really delicious, well made, interesting beers. Plus, their names are very clever and amusing. We stopped by quite a few more breweries in this section as well, and was not disappointed in any of the beers. Remember, Friday Drake's Brewing Company (San Leandro, CA) was out of their Barrel House Sour. We visited them again. They had restocked. I really liked this sour. It had a nice woody - aged flavor underneath the tart sourness. Very nicely done. Then, we headed up to the Mid-Atlantic region to search for one of my Mr. Beer virtual friends, Steve (the Beer Label Man). We had been texting back and forth to meet in person. He was working the L15, Mad Fox Brewing Company. 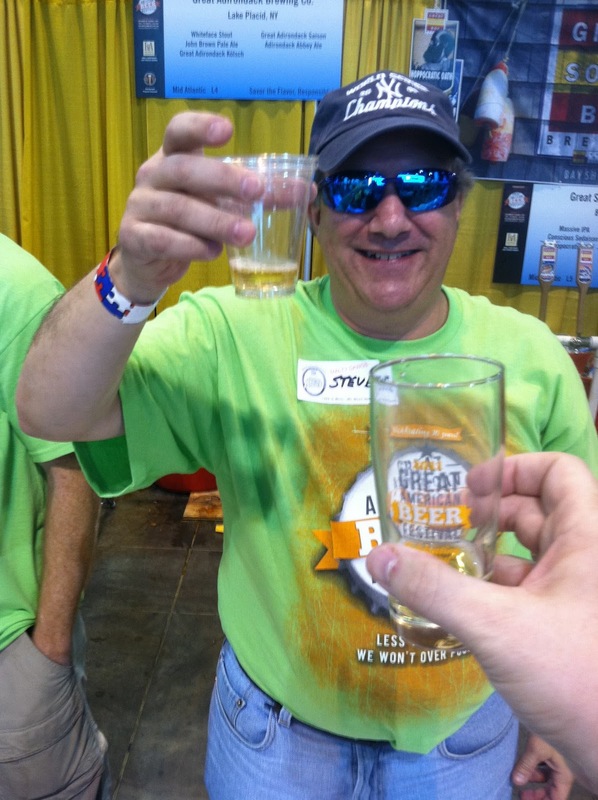 He actually lives in New York and made the trip to Denver to volunteer for the GABF. Brilliant! It was great to meet Steve in person. Nice to know he actually exists in real life. We talked. He got to meet "Mrs. Sheppy". He poured us some beer. He also suggested I check out Captain Lawrence Brewing. I am glad he did. More on that later. Right in Steve's section, was Ithaca Beer Company where I tried Excelsior! Brute. Brute was a nice flavorful golden sour beer. We tried quite a few other breweries around there and thought all the beers there were wonderful. We got to try all the Sam Adam's Long Shot winners. I forgot to mention in yesterday's post that we had tried the employee beers on Friday night. Those were very good. I thought that employee that actually won was the worst of the three, but even though it was not the best of the three, I thought it was worthy of the win. 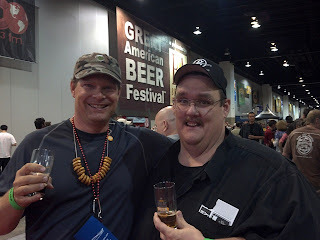 The two home-brewer beer winners were great. 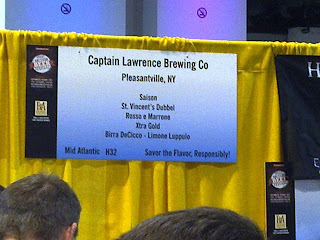 So, let's get back to Steve's suggestion of Captain Lawrence Brewing. Captain Lawrence had a sour beer called Rosso e Marrone. It is an American sour fermented with grapes and aged in oak barrels. It was wonderfully complex with all kinds of fruity notes. Just a wonderful beer. In fact, I am going to call this one my favorite sour of the festival. I might even call it my favorite beer of the festival. I am so glad Steve suggested to stop by this brewery. We tried more beers. We talked to more brewers. We ate off our pretzel necklaces. We wandered around having a good time. 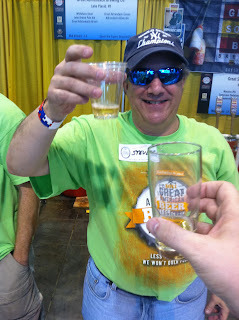 At some point, I sent a text to another one of my Mr. Beer virtual friends, Ken (of Manfish Brewing). He got to this session late, but we decided to meet at the front by 21 A. Ken is from out of town and really seems to have been having a great time at all the sessions. If you are his facebook friend, check out his facebook album for the Great American Beer Fest. We had a great time talking for a few minutes before we went our separate ways. We even got pictures taken together. 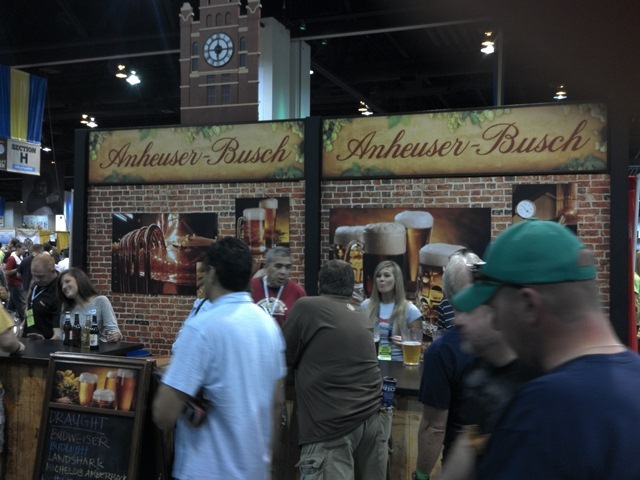 Ken was kind enough to rub it in that he has the GABF iPhone app. It does look really cool and I am looking forward to being able to get a droid app next year that does the same thing. 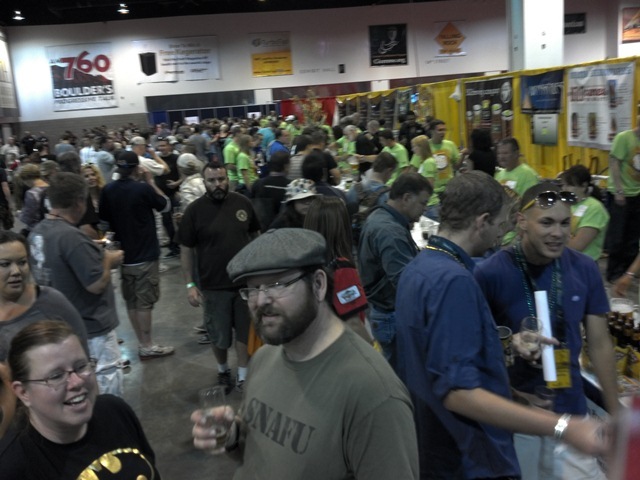 GABF better do a droid app! After we separated from Ken, we did more of the same.... we did more samples. 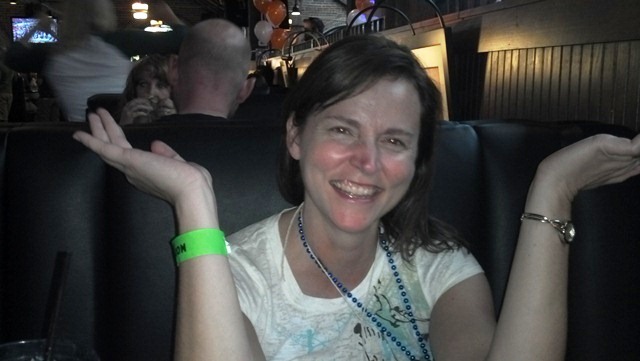 One thing that I totally intended to do and forgot about was to try to meet up with Dave of Fermentedly Challenged. I am kicking myself this morning about that. If I had not forgotten my list in the mini-van I would have remembered, but that is not really all that great of an excuse. I am really sorry, Dave. He had also suggested Trinity Brewing Company's Brain of the Turtle, which was also on my list and which I also forgot. Damn. I missed out on a great sour beer because I forgot my list. Stupid Sheppy. 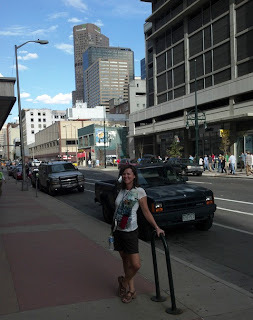 After the GABF, we wandered around Denver. It was really a beautiful Autumn day. We walked over to the Blake Street Tavern (quite a hike from the convention center) for dinner. I have not been to their "new" location. It is very nice. Very big with lots of T.V.s Good beers on tap (although the beer model didn't have any and I just nursed one). 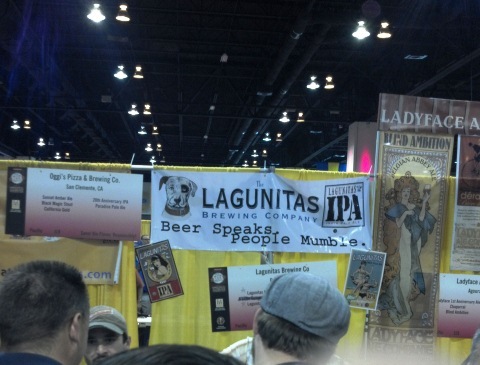 So, that is GABF for us. We survived. We had fun. Good times.